It’s been quite a long summer break, yeah… More than 2 months, actually. I wanted to really enjoy some good holidays away from any social media and travel a bit in Quebec and Morocco. Plus, getting back to work on September as a consultant is always a bumpy road. I just went out from a mission to another with its own new challenges. Nevertheless, I missed posting some of my thoughts or news I found relevant enough to to share them with you. Anyway, enough with the digression and let’s get back to the topic we all love: video games. So what did I do during this 2-month hiatus? I’m not going to make a full review about this game, since everybody already did it and I don’t feel like I can add anything substantial to what was already said regarding Arkham Knight. This is from a guy who already played Arkham Asylum and Arkham City and loved the hell out of them. I deliberately chose to skip Arkham Origins, since it wasn’t developed by Rocksteady and also because it was a prequel. I wanted to know what happened after the events of Arkham City, and boy oh boy, was I not disappointed by the plot of Arkham Knight. Everything about this game felt so familiar yet entirely fresh and refined. The combat system was even more enjoyable than the previous Arkham games and exploration with the Batmobile or by gliding is great and never felt tiresome. Sure, battles with the Batmobile and some puzzles involving the car felt forced and out of place. But the plotline was just amazing. Apart from the obvious identity of the Arkham Knight, plot twists always had you on the edge of your seat. If you haven’t bought it yet, go and do it right now. You have no reason to not be playing such a great game. While I was in Montreal this summer, I went to a Future Shop on the Saint Catherine street. I was able to grab a used copy of Infamous: Second Son for 25 CAD, which is equal to 16€. This is half the price I usually find on Amazon or other websites. Great! Thank god for Playstation and its lack of region locking. Still, I wasn’t able to really try it, but it looks promising. While roaming in a Fnac store in Paris two months ago, I was able to grab a brand new copy of Theathrythm Final Fantasy – Curtain Call with a 80% discount! This brought the game to only 8€. Awesome! This game has been my travel companion for the past two months, as I wanted to take a break from Persona Q. Being able to play through all the amazing songs of the Final Fantasy series is a treat. Plus, I’m a big fan of the game’s art style. That’s why I bought a Sephiroth key chain when I was visiting the Square Enix Café – Artnia – in Shinjuku, Japan. Finally, no amazing deal on this purchase, but it was still worth mentioning: Final Fantasy X/X-2 HD Remaster. It’s been 10 years since my last play through of Final Fantasy X (my third or fourth one, I think). 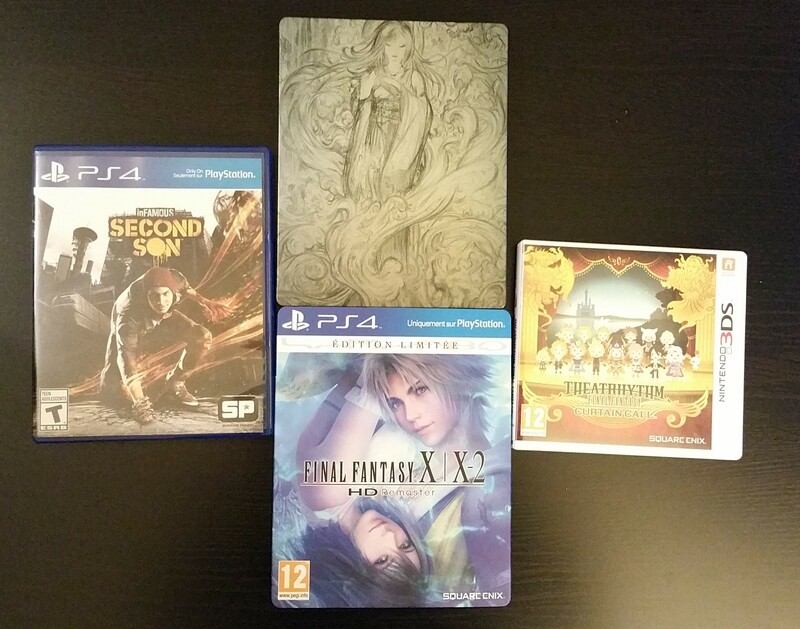 FYI, I went for the Special Edition, which came bundled with a steelbook adorned with awesome artworks of both games by Yoshitaka Amano. Visually speaking, the graphics were boosted compared to the original ones, yet apart from the main characters, NPCs feel like they didn’t really get the HD treatment. Plus, animations didn’t change and they didn’t age well. Taking off the nostalgia goggles, you see a lot of robot-like characters moving during cut scenes. Music-wise, it’s just amazing. You can pick either the original soundtrack or the arranged one. I went for the latter as I’ve been listening to the original one for such a long time. It was kind of expected from Square Enix, but there are no original voices available, so you’ll have to hear the horrible voice acting. I know, I know… It’s the first Final Fantasy game with voiced characters and it’s still so much better than the first Resident Evil voice acting. I’m looking at you, Jill sandwich… Yet, Tidus speaking is just as ear-grating as ever. And don’t even get me started on the Tidus laughing scene. This is definitely one of my top 10 most WTF and awkward moments in video games. And I can’t believe I’m saying this, but this scene is even worse in Japanese. But wait, don’t get me wrong, Final Fantasy X is still one of my favorite Final Fantasy games. The gameplay is still rock solid and battles are great, especially the boss ones. We’re talking about 100 hours of content with enough challenges to have your money’s worth. Regarding FFX-2, I don’t have that much to say because I only played 2 or 3 hours when the game was originally released. I’ll definitely give it a second chance, but not right now. If you happen to read this, you have my sincerest thanks for stopping by and taking some of your precious time to read this. See you soon in a next post! ← Street Figher V: Necalli enters the ring! It might be hard going back to the previous gen, but you should go back and Play Batman Arkham Origins. I felt it was one of the best, even though it was a prequel. It had cool boss fights, and even though it wasn’t Rocksteady, it was still WarnerBros and the Rocksteady’s engine, with their teams input. I still have some unfinished business on the 360, so I might give it a try. I do agree with you on the fact that the game is certainly good, but the common grief I’ve heard people had with the game was that it wasn’t innovating that much from Arkham City. i.e. it’s a good game, but not as good as what people were expecting. True. It’s more of the same but with a prequel setting and different bosses. City, tools, navigation all the same. 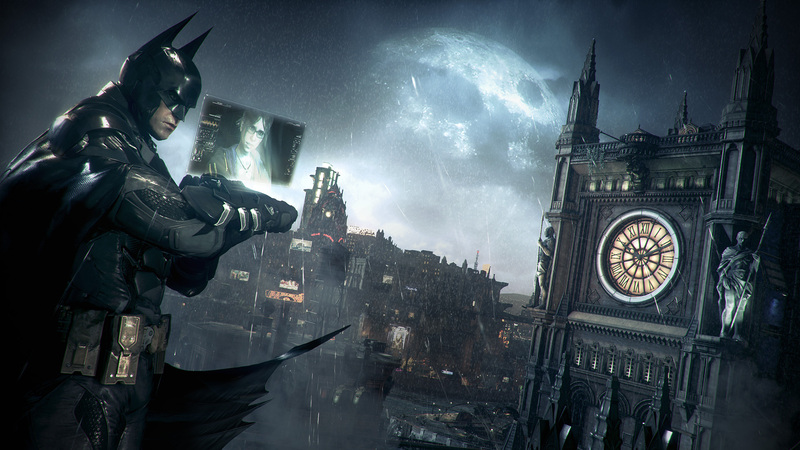 Arkham Knight made huge strides forward with the batmobile.